How do you know which tub to shower conversion kit is the right size for your tub? We offer three sizes of tub to shower conversion kits: small, medium and large. First determine where you will cut the tub. 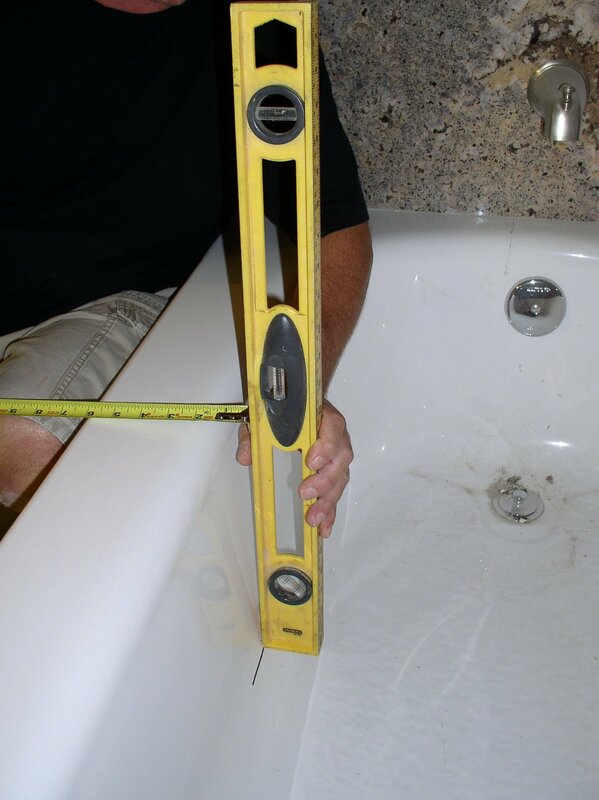 Then take a few measurements to easily identify the correct tub to shower conversion kit for your tub. Where will you install the tub to shower conversion kit on the tub? Is the design on the front of your tub flat? Or is it either offset or curved across the front of the tub? You will have to take this into consideration when measuring for your tub to shower conversion kit. Since the conversion kit piece is straight; when it is installed on a curved tub front, there may be sections where it extends past the tub wall more at some places than others. This is also why it is extremely important when taking the rail measurement to be sure you take it at the widest point where you will actually install the tub to shower conversion kit. The most important factor in determining which size tub to shower conversion kit to order is the measurement of the tub rail. This is the wall portion of the tub that you are currently stepping over and will be cutting out. This is the primary indicator for which size tub to shower conversion kit to order. Please note that most tub rail designs will widen and curve as they reach the floor of the tub. Therefore, you will want to make sure you measure the rail from the widest point at which the tub to shower kit will be placed. Not simply across the top of the tub rail. 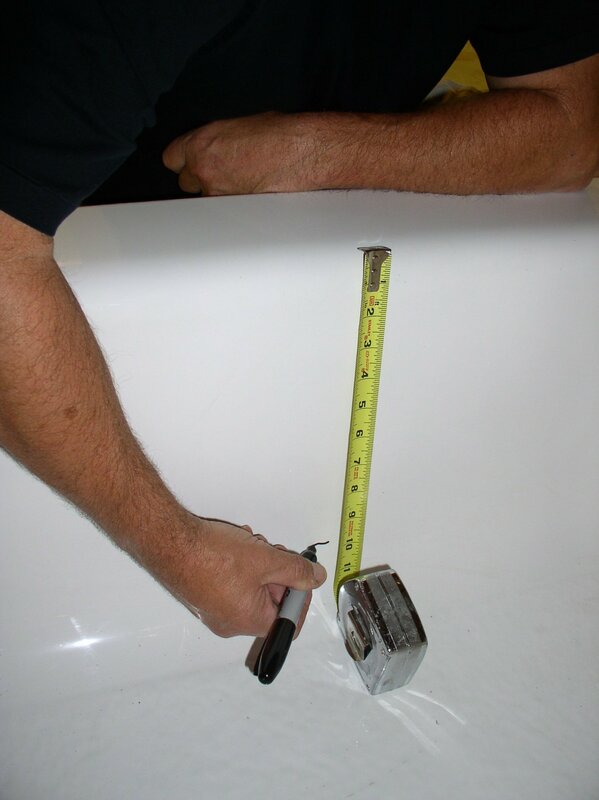 You need to measure down 10″ on the INSIDE of the tub rail wall and mark it. Then use a level and tape measure together to determine the rail measurement at the widest point. A. Place one end of the level on the mark you made. B. Align the top bubble to make sure you are holding it level. C. Run the tape measure from the aligned level to the opposite edge of the tub rail. Read the measurement. Some tubs may have little to no variance between the measurement at the top of the tub rail and the widest rail measurement. On this example, however, it reveals an offset of 1/2″. This could indicate a larger size tub to shower conversion kit is required rather than what taking the measurement across the top of the rail would have indicated. Compare your measurements to those in this chart. Then select the correct conversion kit. Be sure that your rail measurement is correct. If you choose a tub to shower conversion kit where the rail measurement is too small and the template does not fit over your tub; the step through insert will not fit either. Likewise, if you select your tub to shower conversion kit using rail measurements that are too big or are padded; the insert should still fit your tub. However, it may extend further into and/or outside the tub than you would like. Are you ready to buy the tub to shower conversion kit? Please purchase your tub to shower kit through our online store! If you have questions regarding the installation process for the tub to shower conversion kit or any of our other bathroom safety products, contact us. We are available to answer questions and take orders Monday through Friday from 9am to 5pm Eastern Time.